Code of Conduct Tribunal say Chief Justice of Nigeria wey dey suspension, Justice Walter Onnoghen still get case to ansa. Di Tribunal say make Onnoghen start im own defence on top di six different accuse wey dey im head say im no declare im assets. 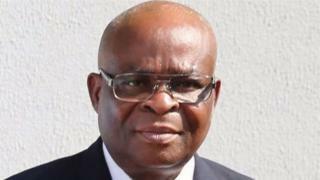 Oga Onnoghen bin accuse Code of Conduct Bureau say dem no follow di correct procedure wen dem do case against am. Im tok dis one as di trial resume on Friday for Abuja. Im team of lawyers bin argue say di three witness dem wey di prosecutor cari come no give any real evidence to prove di case. But di three oga dem for di Tribunal wey Danladi Umar dey lead, tell di suspended Chief Justice say im get case to ansa so make im prepare im defence. Na for January oga Onnoghen case land for Code of Conduct Tribunal afta Code of Conduct Bureau charge am say im no declare evri-evri wey im get. Inside di six different accuse wey dem bring against am, dem say Onnoghene also give fake declaration of im assets as im no include moni wey dey inside im account wey Standard Chater Bank bin dey manage.